Ri Chun Hee presents news of Kim Jong Un's meeting with Donald Trump on Korean Central TV on June 13, 2018. North Korea’s state broadcaster, Korean Central Television (KCTV), has had to tread a fine line covering this year’s international summits and diplomatic events. On the one hand, the numerous summits have been something to hail, having put Kim Jong Un concretely on the global stage, broken the country’s international diplomatic isolation and potentially laid the groundwork for getting sanctions relief and boosting the North Korean economy. But danger isn’t far away. If Kim’s regime is seen by the North Korean public to align itself too closely with foreign governments, especially South Korea and the US, it risks reversing years of anti-South Korean and anti-US propaganda. While state media has laid off those themes since the summitry began, it may need to revive them if diplomacy falls apart. Taken together, KCTV coverage of this year’s summits shows this balancing act: while Kim Jong Un’s meetings with South Korean and US leaders have dominated world headlines, Kim’s meetings with Chinese leader Xi Jinping have received far greater coverage inside North Korea. Events involving Kim Jong Un take precedence over all other news and are generally broadcast several times a day outside of regular news bulletins. A typical pattern is to run a bulletin shortly after TV broadcasting begins at 15:00 then repeat it at 17:00 and 20:00, in each case pushing back the regular news bulletin. It then gets a final broadcast shortly before TV wraps up for the evening at around 22:30. In many cases, these reports are simply an anchor in a studio reading a script. Sometimes still photos are used to illustrate the news and occasionally video images. If the news is big enough, the reports will get repeated the next day at slightly different times. A KCTV news anchor announces the signing of a declaration between Kim Jong Un and Moon Jae-in during a bulletin on September 20, 2018. After major events, North Korean TV follows the immediate news reports with a documentary that, unless it was used in the report, includes the first video of the event. In the past, KCTV used to produce these once every couple of months as a wrap-up of Kim Jong Un’s activities, but recently, these documentaries have been appearing after each major event. The delayed coverage has an advantage: it gives the state propaganda machine time to see the outcome of an event and figure out how it will be best framed. Kim Jong Un’s visit to Beijing between March 25 and 28 was his first known international trip as leader and first summit meeting and received more coverage on KCTV than anything else so far this year. Word of the visit leaked to international media after his train was spotted in Beijing, but state TV didn’t report anything until the day he returned home. At 15:14 on March 28, KCTV broadcast an exceptional eight consecutive reports on different aspects of the trip. The reports were repeated three more times on March 28 and by the time broadcasts began on March 29, a 42-minute long documentary was ready to air. It debuted at 15:08 and was broadcast an additional 12 times until April 1, for a total of 533 minutes of airtime over 4 days. Unusually, it preempted the 17:00 and 20:00 news on two consecutive nights. Clearly, state TV was signaling to its viewers that this was an item of major importance. A huge international media operation beamed live pictures around the world of Kim Jong Un and South Korean President Moon Jae-in’s first meeting at Panmunjom on April 27, but when they shook hands across the military demarcation line at 09:30, North Korean TV wasn’t even on the air. It began April 27 with programming as scheduled at 15:00 and ran a brief news bulletin announcing that Kim had departed Pyongyang for Panmunjom to meet Moon. For many North Koreans, this would be the first they knew about the summit. But strangely, the news bulletin wasn’t repeated at all for the rest of the day. It’s unusual that news regarding Kim Jong Un disappears so quickly. On April 28, news of the summit was broadcast on state TV at 15:09, shortly after sign-on. The news consisted of a string of eight reports read by five different anchors, without the customary break between each report. The entire package had a single title rather than being broken up into eight reports and included no still or video images. It was subsequently aired at 17:00, 20:00 and 21:37, and those airings included extensive video from the previous day’s events. Why this wasn’t included in the initial broadcast is unclear, although it probably had to do with the footage either not being completely edited or not approved for broadcast. The news bulletins were repeated three times on Sunday and it wasn’t until Monday that Korean Central TV broadcast a documentary. This was a longer delay than is typical. With events happening at the border, the delay is notable. The documentary aired 12 times over 6 days. No other documentary broadcast this year has been shown on as many subsequent days as this one. News of Kim Jong Un’s second trip to China to meet with Xi Jinping, from May 7 to 8, broke with an 18-minute report preempting the 20:00 news on the day he returned. It aired later in the evening too. This same-day coverage was accompanied with no photos or video but, by the time broadcasts began on May 9, a 27-minute documentary was ready to air. This notably faster pace was probably due to the less sensitive nature of the meeting. The documentary was broadcast 13 times over 5 days. On May 26, Kim Jong Un and Moon Jae-in met again in Panmunjom, this time with less fanfare from the global media. No news of the meeting was aired on May 26, but by May 27, KCTV came on the air early, airing a documentary on the meeting at 09:12. It was broadcast 11 times but was gone after 3 days. State media was unusually confident with its coverage of the Singapore Summit between Kim Jong Un and US President Donald Trump. For the first time on one of Kim’s overseas trips, state media carried reports while the event was going on rather than waiting for Kim to get back home and the full results to be clear. The reports were still a day late, but North Koreans were better informed than normal. It’s tempting to think this is because of the large amount of foreign media coverage of the summit that was inevitably going to leak into the country and the government’s desire to shape its message as fast as possible. Kim Jong Un arrived in Singapore on Sunday, June 10, and North Korean TV viewers first saw reports of this on Monday, June 11, with news of Kim’s departure from Pyongyang, his arrival in Singapore and a meeting with Singapore’s Prime Minister Lee Hsien Loong. All three reports were accompanied by still images and they were repeated at noon and then three times in the afternoon. 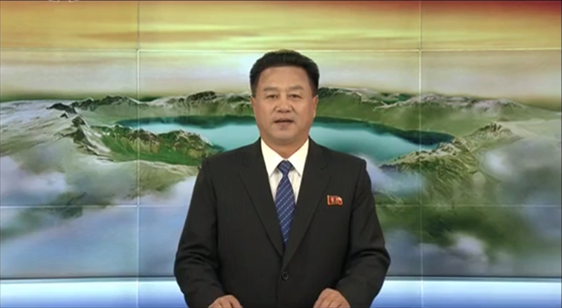 Interestingly, North Korean TV dropped the still images from the final three broadcasts of the report. The following day, while the world was watching live TV images of Kim Jong Un and Donald Trump meeting in Singapore, KCTV carried a single report on Kim’s night-time outing in Singapore the evening before. It contained no still photos and was repeated throughout the day. At 19:00, an additional report was aired noting that Kim Jong Un had returned to North Korea. Again, it’s relatively unusual for state media to report on Kim’s comings and goings on the same day unless it’s a televised event like a military parade. In less than 24 hours, North Korean TV had turned around the footage from Singapore and it started the Thursday broadcast with the first of what would be 11 airings of the documentary on the event. Kim Jong Un departed Pyongyang on Tuesday morning, June 19, by plane to Beijing where he met with Xi Jinping to brief him on the outcome of the summit meeting with Donald Trump. As usual, North Korean state media was silent on Tuesday about the trip. The next two days followed the typical cycle: reports repeated throughout the day of day-old news., But again, there was a short turnaround for the documentary. It aired first on June 21, the day after Kim returned home, and was broadcast a total of 11 times. Coverage of the North-South summit in Pyongyang held September 18-20 was notable for several reasons. The first and perhaps most surprising was the live coverage from Pyongyang of Moon Jae-in’s arrival in the city and his welcoming by Kim. I believe this might have been the first time that live images of an event in Pyongyang involving Kim Jong Un have been seen globally but not within the country. Typically, any live images out of North Korea, especially of major events, are picked up from a KCTV broadcast, but this time it was different. Thanks to a South Korean TV pool, the world was watching Kim Jong Un live and the signals were not being managed by a North Korean producer. With events happening at the Pyongyang Airport and the city center, and a VIP visit clearly evident to Pyongyang residents, you would think KCTV would lead with the news in the evening, right? Wrong. Despite the events happening on its doorstep, news of Moon’s arrival and his welcome by Kim was not broadcast until the next day. Although on this occasion, the reports all included video: likely a product of it being so quickly available. On September 19, with the summit already wrapped up, North Korean TV signed on air in the afternoon with seven special reports on the previous day’s activities but none of the reports included video. The reports were repeated on Friday and a documentary finally aired on Saturday. It was broadcast just five times over two days and then disappeared. The difference in the way KCTV treated these events is interesting. It is clearly able to turn around video and produce documentaries with great speed when useful, so why the two-day delay for an event that happened in Pyongyang? Presumably, this signals another factor: most likely the question of how an event should tie into existing propaganda and what might be said in the future. Of the major events in 2018, documentaries on all of those involving a meeting with Xi Jinping have aired the day after Kim returned to Pyongyang. The Singapore Summit and Pyongyang Summits saw a two-day delay and the Panmunjom Summit documentary came three days after the event. And then there’s the length of coverage. The longest documentary was on the Pyongyang Summit at 71 minutes, but because it quickly disappeared, it was on air a total of just under 6 hours. The documentary on the Singapore Summit was second longest at 42 minutes and was aired for a total of 7 hours 42 minutes. That’s about the same as those on the Panmunjom Summit and Kim’s second trip to China. By far, the documentary that received the most airtime in 2018 was the first one of Kim’s initial trip to Beijing. It was 41 minutes long and aired for a total of just under 9 hours. So again, China comes out as favored. Just as important as what KCTV said about these events is what it didn’t. When the idea of a summit between Kim Jong Un and Donald Trump was being considered, some in the US argued against it because of the propaganda potential. An often-heard rationale was that images of the two together would be repeatedly broadcast on North Korean TV to show Kim as an equal with Trump on the world stage. Not only did that not happen, but it showed a misunderstanding of the way Kim Jong Un is portrayed to the North Korean public. Kim does not need to be seen as equal to Trump because, in the eyes of the North Korean propaganda machine, he’s already ahead of all other world leaders. This claim isn’t based on his dealings with other world leaders but on the things he does himself, directly for the North Korean people. The cult of Kim Jong Un isn’t reliant external influences, but on him alone. After the Singapore Summit, KCTV aired its customary documentary but it was no more or less a propaganda piece than similar documentaries. And since the meeting, video of the Trump-Kim summit has not been seen on North Korean TV. Neither has video of Kim meeting with Xi Jinping or Moon Jae-in for that matter. In fact, coverage of 2018’s diplomatic events has not been woven into any of the propaganda pieces that, accompanied with revolutionary music, fill the gaps between programs on North Korean TV. The composition of those remains consistent: Kim Jong Un conducting on-the-spot guidance, being welcomed by cheering workers and inspecting military units. KCTV coverage on March 28, 2018 included: “조중친선을 새로운 높은 단계에로 추동한 력사적인 사변 / 경애하는 최고령도자 김정은동지께서 중화인민공화국을 비공식방문하시였다,” (“Kim Jong Un Pays Unofficial Visit to China”) https://www.youtube.com/watch?v=Dz9blycvclA; “경애하는 최고령도자 김정은동지를 환영하는 의식이 인민대회당에서 성대히 거행되였다,” (“Ceremony Welcoming Kim Jong Un Held at China’s Great Hall of People”) https://www.youtube.com/watch?v=I9eWJqYCQMg; “경애하는 최고령도자 김정은동지께서 중국공산당 중앙위원회 총서기 습근평동지와 회담하시였다,” (“Kim Jong Un Has Talks with Xi Jinping”) https://www.youtube.com/watch?v=Qz1YtNIMymw; “경애하는 최고령도자 김정은동지의 력사적인 중국방문을 환영하여 습근평동지가 성대한 연회 마련” (“Xi Jinping Hosts Banquet for Kim Jong Un,”) https://www.youtube.com/watch?v=a7JGohtEz7M; “경애하는 최고령도자 김정은동지께서 습근평동지가 마련한 오찬에 초대되시였다,” (“Kim Jong Un Invited to Luncheon Hosted by Xi Jinping”) https://www.youtube.com/watch?v=1OcdLnXNsfg; “연회에서 하신 김정은동지의 연설,” (“Kim Jong Un’s Speech at Banquet”) https://www.youtube.com/watch?v=HGj1fnWr-3o; “연회에서 하신 습근평동지의 연설,” (“Xi Jinping’s Speech at Banquet”) https://www.youtube.com/watch?v=5GJ5yg0eTe; “경애하는 최고령도자 김정은동지께서 중국공산당 중앙위원회 총서기이시며 중화인민공화국 주석이신 습근평동지에게 감사전문을 보내시였다,” (“Kim Jong Un Sends Message of Thanks to Xi Jinping”) https://www.youtube.com/watch?v=jFLiEkEWS2g. The June 11 KCTV coverage with photos omitted: “김정은 위원장, 미합중국 대통령과의 력사적인 첫 상봉과 회담을 위하여 평양을 출발하시였다,” https://youtu.be/SPabFlAQRZY; “김정은 위원장, 싱가포르공화국에 도착,” https://youtu.be/D9rGpBKz5Aw; “김정은 위원장, 싱가포르공화국 수상 접견,” https://youtu.be/gAkUhN5AO7I. 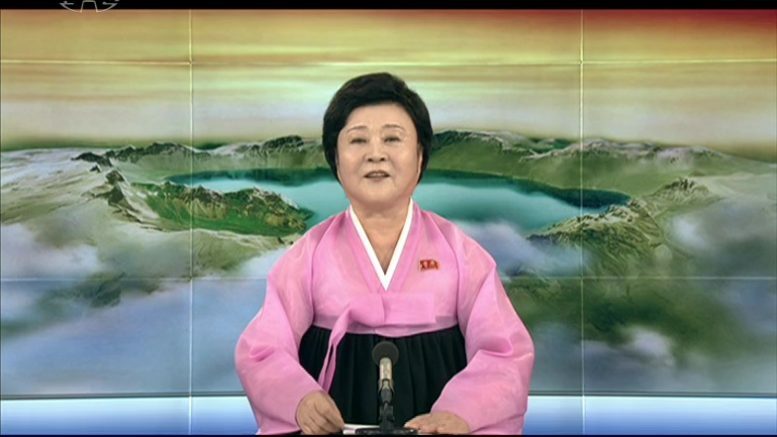 Ri Chun Hee is not only KCTV’s most recognizable anchor but also its most senior one. In the last few years, she has retreated from daily news coverage to appear only for significant news announcements. She was the one who announced the death of Kim Jong Il, the North’s successful nuclear tests and its major missile developments. Her mere presence on screen is another way the North Korean propaganda machine signifies to the population that the bulletin is important and that their attention is needed. June 13 KCTV coverage included: “조미관계의 새 력사를 개척한 세기적만남, 력사상 첫 조미수뇌상봉과 회담 진행 우리 당과 국가, 군대의 최고령도자 김정은동지께서 미합중국 대통령과 공동성명 채택,” (“Historic First DPRK-U.S. Summit Meeting and Talks Held”) https://youtu.be/MldakfDnmSQ; “김정은 조선민주주의인민공화국 국무위원회 위원장과 도날드 제이.트럼프 미합중국 대통령사이의 싱가포르수뇌회담 공동성명,” (“Joint Statement from Kim Jong Un and Trump after Summit”) https://youtu.be/QrUKERjNCgU; “경애하는 최고령도자 김정은동지께 싱가포르공화국 수상이 축하편지를 보내여왔다,” (“Congratulatory Letter to Kim Jong Un from Singaporean PM”) https://youtu.be/tyOVGVhg3tQ. KCTV coverage from June 20: “조선로동당 위원장이시며 조선민주주의인민공화국 국무위원회 위원장이신 우리당과 국가, 군대의 최고령도자 김정은동지께서 중화인민공화국을 방문 / 경애하는 최고령도자 김정은동지께서 중화인민공화국을 방문하기 위하여 출발하시였다,” (“Kim Jong Un Leaves for China”) https://youtu.be/4bwKMiQTUDU; “경애하는 최고령도자 김정은동지께서 중화인민공화국의 수도 베이징에 도착하시였다,” (“Kim Jong Un Arrives in Beijing”) https://youtu.be/8-v8NHv9bX0; “경애하는 최고령도자 김정은동지께서 습근평동지와 상봉하시였다,” (“Kim Jong Un Meets Xi Jinping”) https://youtu.be/O9Zu6aq3Fvk; “조선로동당 위원장, 조선민주주의인민공화국 국무위원회 위원장 김정은동지께서 중국공산당 중앙위원회 총서기, 중화인민공화국 주석 습근평동지와 회담하시였다,” (“Talks between Kim Jong Un and Xi Jinping”) https://youtu.be/TH5tQbFzHeI; “경애하는 최고령도자 김정은동지의 중국방문을 환영하여 습근평동지가 성대한 연회를 마련하였다,” (“Banquet Given in Welcome of Kim Jong Un’s China Visit”) https://youtu.be/tOcfKPkfjPE. Additional mentions on June 21 as part of KCTV’s coverage of Kim Jong Un’s undertakings: “조선로동당 위원장이시며 조선민주주의인민공화국 국무위원회 위원장이신 우리 당과 국가, 군대의 최고령도자 김정은동지께서 중화인민공화국을 방문 / 경애하는 최고령도자 김정은동지께서 습근평동지와 또다시 상봉하시였다,” (“Kim Jong Un Meets Xi Jinping Again”) https://youtu.be/yO4kh54w4BY; “경애하는 최고령도자 김정은동지께서 중국농업과학원 국가농업과학기술혁신원을 참관하시였다,” (“Kim Jong Un Visits State Agricultural Sci-tech Innovation Institute of China”) https://youtu.be/BKnDljoFNvo; “경애하는 최고령도자 김정은동지께서 베이징시궤도교통지휘쎈터를 돌아보시였다,” (“Kim Jong Un Visits Beijing Municipal Track Traffic Control Centre”) https://youtu.be/4liRXEb1Y3E; “경애하는 최고령도자 김정은동지께서 중화인민공화국주재 우리 나라 대사관을 방문하시였다,” (“Kim Jong Un Visits DPRK Embassy in Beijing”) https://youtu.be/fef2J6MK5XI; “경애하는 최고령도자 김정은동지께서 중화인민공화국방문을 성과적을 마치고 조국으로 돌아오시였다,” (“Kim Jong Un Returns Home from China”) https://youtu.be/JiDUaHJAVWc. KCTV coverage from September 19: “력사적인 북남수뇌상봉을 위하여 평양을 방문하는 문재인대통령과 일행 도착 경애하는 최고령도자 김정은동지께서 문재인대통령을 평양국제비행장에서 맞이하시였다,” (“President Moon Jae In Arrives to Visit Pyongyang”) https://youtu.be/-bavr5ymtng; “제5차 북남수뇌회담 진행, 경애하는 최고령도자 김정은동지와 문재인대통령사이에 회담이 있었다,” (“Fifth Inter-Korean Summit Held”) https://youtu.be/Aq3EbGLxNl4; “문재인대통령을 환영하는 예술공연 진행, 경애하는 최고령도자 김정은동지께서 공연을 관람하시였다,” (“Art Performance Given to Welcome President Moon Jae In”) https://youtu.be/Si-W6sRbOek; “경애하는 최고령도자 김정은동지와 문재인대통령의 평양방문을 환영하여 성대한 연회를 마련하시였다,” (“Supreme Leader Kim Jong Un Hosts Banquet for President Moon Jae In”) https://youtu.be/vnHwkEOb-7I; “문재인대통령 부인 김정숙 여사 목류아동병원 등 참관 / 김영남 남측의 대통령 수행원들 접견 / 김영대 남측의 사회계 인사들과 담화,” “(President Moon Jae In’s Wife Visits Okryu Children’s Hospital, Kim Won Gyun University of Music”) https://youtu.be/Ui8uPNU-N7w. Additional KCTV coverage on September 20: “경애하는 최고령도자 김정은동지께서 문재인대통령의 숙소를 방문하시고 제2일회담을 진행하였다,” (“Supreme Leader Kim Jong Un Has 2nd-Day Talks with President Moon Jae In”) https://youtu.be/LjM2GQQnQJA; “경애하는 최고령도자 김정은동지께서 문재인대통령과 함께《9월평양공동선언》에 서명하시였다,” (“Supreme Leader Kim Jong Un Signs Joint Declaration with President Moon Jae In”) https://youtu.be/tOArPQEztsc; “경애하는 최고령도자 김정은동지와 문재인대통령이《9월평양공동선언》과 관련한 공동발표를 하시였다,” (“Supreme Leader Kim Jong Un and President Moon Jae In Make Joint Statements on Joint Declaration”) https://youtu.be/Jqswj7flkVQ; “9월평양공동선언,” (“Joint Declaration Signed by Supreme Leader Kim Jong Un and President Moon Jae In”) https://youtu.be/U8lThTfHMho; “경애하는 최고령도자 김정은동지께서 문재인대통령과 오찬을 함께 하시였다,” (“Supreme Leader Kim Jong Un Has Luncheon with President Moon Jae In”) https://youtu.be/szegiYMGf7I; “경애하는 최고령도자 김정은동지께서 문재인대통령과 만찬을 함께 하시였다,” (“Supreme Leader Kim Jong Un Has Dinner with President Moon Jae In”) https://youtu.be/ugQrYkkDp74; “경애하는 최고령도자 김정은동지께서 문재인대통령과 함께 대집단체조와 예술공연을 관람하시였다,” (“Supreme Leader Kim Jong Un with President Moon Jae In Sees Grand Mass Gymnastics and Artistic Performance”) https://youtu.be/N_ZQdHQ30I0.